Look at brand guidelines for most technology companies, and you’ll probably find a page or two about voice. It will include traits like human, friendly, honest, innovative, and trustworthy. But let’s face it, when is the last time you described a person as “human and innovative”? Like every person, your business is unique. How can you prove to customers that you're not a robot if you sound like every other beep and boop out there? 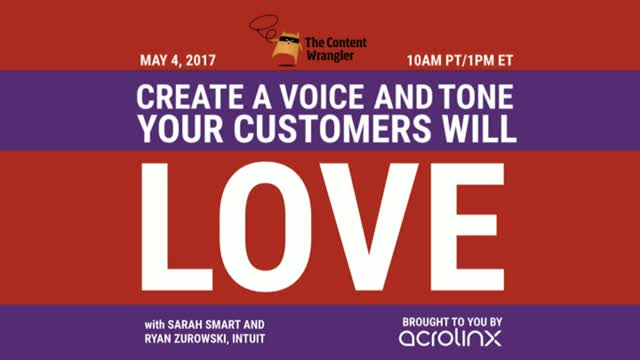 Join me, Scott Abel, The Content Wrangler, and my two special guests for this free one-hour webinar. My guests will be Sarah Smart, Senior Content Designer at Intuit, and Ryan Zurowski, Brand Storyteller at Intuit, who will talk about developing a brand voice-and-tone strategy that reflects your company’s unique values and personality. They will help you define who you are and how you want to sound, and to develop a playbook that will help everyone who creates content for your business—from copywriters and designers to marketers and business partners. Best of all, you will learn how to improve the customer experience by making people feel something when they interact with you. At the end of the hour, you should understand voice and tone, why they’re important, and how they’ll help improve your customer experience. You'll have a blueprint for developing guidelines that engage your customers and rally your organization, and you'll know how to teach the guidelines to everyone in your organization—whether it's a team of ten or ten thousand. Brought to you by Acrolinx—the only software that can “read” your content, score it, and guide you to make it better—and better content means better business results. Check them out on the web at www.acrolinx.com.